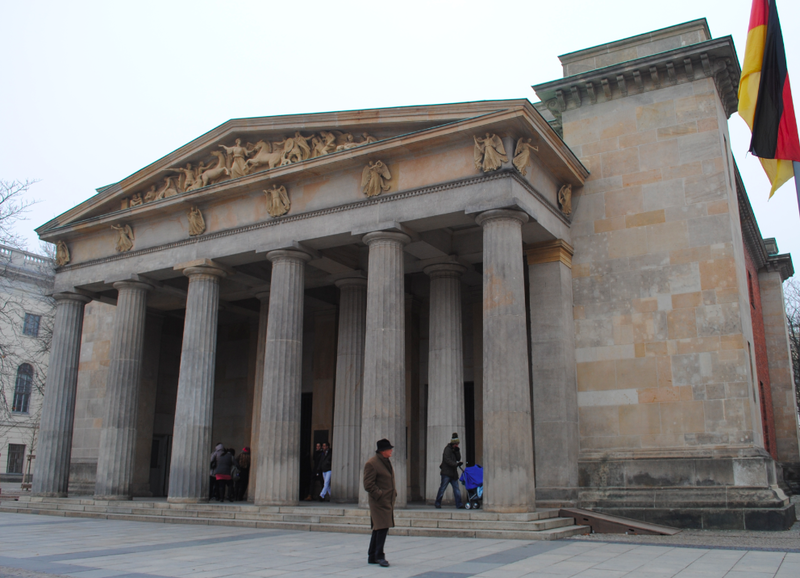 The Neue Wache (New Guard House) is located on the north side of Unter den Linden. The building was constructed in 1816-1818 as a guard house for the troops of the Crown Prince of Prussia, King Friedrick William III. Karl Friedrich Schinkel, the Prussian architect, furniture and stage set designer and city planner was commissioned to design the building. Schinkel was known for his Greek Revival style of architecture which can be seen with the Doric order of columns and the portrayal of the Greek Goddess Nike in the statuary of the pediment. Until the end of World War I, the building continued to serve as a royal guard house. The German architect and urban planner Heinrich Tessenow was commissioned in 1931 to redesign the building as a war memorial for the fallen during the war. Tessenow added an oculus to the building which then became known as the ‘Memorial for the Fallen of the War’. The sculpture ‘Mother with her Dead Son’ is the work of Kathe Kollwitz who was a German sculptor, painter and printmaker. Directly under the oculus, the sculpture is symbolic of the suffering of civilians during World War II.